Here’s something to think about for a couple of moments: how fearful are you of losing what you have, versus how excited you are about what you could gain? Depending on your answer, does this change the way you feel, does it change the way you think, and crucially, does it change the way you behave? As brand makers, storytellers and designers, we regularly encounter these squeaky bum moments. It’s at such times that we do well to remember—particularly when we risk losing a lot—that today’s strength could eventually be the shackle that leads to our downfall. This is, after all, the brand fairytale equivalent of Jack and the Beanstalk. The giant seemingly has everything in his favour; he’s big, rich and powerful. Whereas dear old Jack is small, poor and weak. It’s the resourced versus the resourceful. Let the battle commence! Donkey’s years ago I came across this very useful tool from the sagacious Mr. Charles Handy in the thought provoking Empty Raincoat. According to Handy, the best time to start a new ‘curve’ is before you reach the peak of your existing one. That way you start something new when you still have the resources, and the right attitude, to take it to new heights. In contrast, most people only think of doing something new and different when they’ve reached the bottom of what they’re presently involved in. By then, of course, they’re on the downward slope rather than the upward curve. All brands start at the beginning of the Sigmoid curve—they’re full of desire, excited by what lies ahead, and are motivated to make a difference. They’re like our Jack. Over time their Jack-like attitude helps them climb the curve and become successful, until eventually they claim their crown as the giant. Then there’s no reason to change, to do things differently or be brave anymore; like the giant they rule their kingdom, they define their world and they’re comfortable. Until, that is, another Jack tip-toes ever so quietly over the perimeter edge of their realm without them even noticing. By the time they recognise the threat it’s too late and, like the giant in the story, they’re eventually toppled. So how does the giant think more like Jack and learn to ride the Sigmoid Curve? The simple answer is for the giant to step into Jack’s shoes, no matter how tight a squeeze they might be. Jack has a few things that, on the face of it, look like limitations. He hasn’t been through the learning curve yet, so he’s a little naïve. However this also means he isn’t polluted by experience and a belief that ‘this is the way things are done’. Jack’s not weighed down by the baggage of history; for him everything is still possible. His devil-may-care, playful approach is a key ingredient to his resourcefulness, because when you feel like you’re playing, you’re actually feeding the creative side of your brain. Playing enables you to suspend the serious business of life, and gives you the freedom to look at things afresh. Back in the day when Innocent smoothies first played at being Jack they had no money for advertising, so they used their packs instead. Specifically their back of pack labels, which, instead of just being used for the usual mandatories (the fruit drink establishment way) became the soapbox for the brand’s attitude. So rather than have the same content on every pack, they were resourceful enough to plan their print runs to create a variety of labels for the different stories they wished to eulogise. Likewise brand minnows The Saucy Fish Co. had to play like Jack. The big fish of the day like Young’s and Birds Eye were the Leviathans, providing us Brits with our traditional fish fayre. How could The Saucy Fish Co. possibly compete? Well, they went to places the others didn’t – the world of fresh not frozen—and they thought like a sauce company not just a fish company. Finally, they took the fear out of cooking what was thought to be expensive, difficult and smelly, and created a brand that was cool and contemporary, not traditional. That’s why today, with £35 million in sales, a tiny fish company from Grimsby is rubbing shoulders with Facebook, Porsche and Selfridges after being short-listed as one of Britain’s coolest brands. Photo. The Saucy Fish Co.
Just because you’ve become successful doesn’t mean that you can’t think small again. It’s hard, yes. You may need to challenge your existing business model, you may need to introduce a new complementary one, or you may just need to rekindle that old Jack spirit, much like serial sausage entrepreneurs Debbie and Andrew Keeble. Having set up a successful sausage business under their own names in 1999, the couple started all over again with a new range of bangers called Heck! The original Debbie and Andrew’s brand was the number one premium sausage in the UK when they sold it to a ‘giant’, but the partnership didn’t work out. Hence the parting of ways and the new brand Heck! 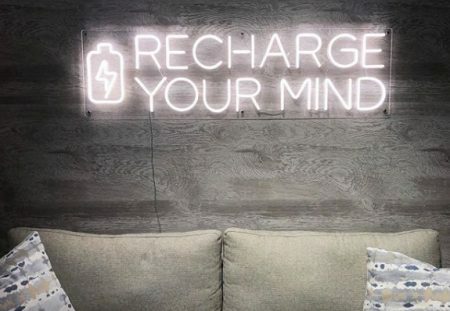 The brand is named after one of Debbie and Andrew’s mantras: whenever they faced a difficult risk-and-reward business decision they’d take a moment to look at each other and say ‘what the heck!’ It’s the sort of courageous attitude that’s resulted in Heck! out-selling Debbie and Andrew’s, even at their peak. 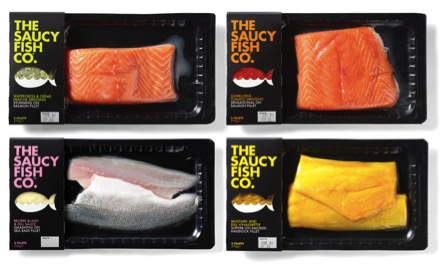 The brand, much like The Saucy Fish Co., isn’t afraid to break the mould. 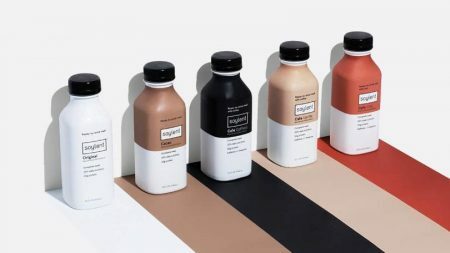 Having previously led the premium sausage pack with a personality brand—establishing black as the category signpost – with Heck! they took a completely different approach. Bold pastels block merchandise on shelf to provide a stark to the sea of black. There’s a no-nonsense simplicity that provides authenticity (reassuring considering recent food scares), whilst the name itself confidently talks about the family’s attitude to big business, preferring to stay true to their own recipes, ideas and integrity. Another way to get in touch with the Jack inside comes from multinational Diageo, who’ve created Distill Ventures as a way to explore its own business model, without necessarily messing up the giant’s day to day work. According to Diageo it’s ‘the world’s first accelerator dedicated to new and growing premium spirits brands.’ The venture is a collaboration with innovation specialist Independents United, and takes a sort of Dragon’s Den approach to investing in up and coming entrepreneurial drinks ideas. Diageo put in money, advice and expertise, and in return get an insight into what’s coming down the tracks drinks-wise, plus first dibs on the right to buy the whole business at a defined point in the future. 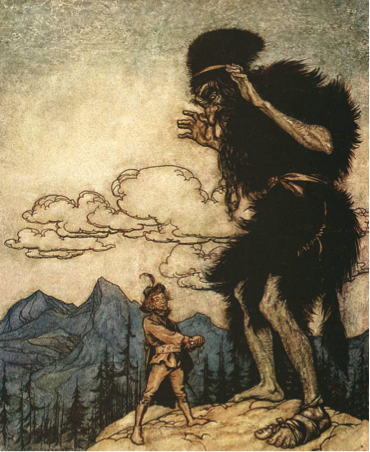 So are you Jack or the giant? Where are you on the Sigmoid curve? And do you have everything or nothing to lose? Most importantly, what (the heck) are you going to do about it? Greg Taylor became founding partner in global brand design consultancy Elmwood in 1989. Now Director of Brand Provocation, Greg is the creator and facilitator of Step Change™, Elmwood’s strategic tool for moving ideas forward. Clients include ASDA, Wal-Mart, Arla Foods, BBC, COI (Defra and DfT), Cable&Wireless, Comic Relief, Debbie & Andrew’s, Durex, Glasgow 2014 Commonwealth Games, McCain, and the Met Office. Posted in Opinion and tagged branding, challenger brands. Bookmark the permalink.